At their Brixton O2 Academy headline show in 2014, Babymetal kicked and twirled their way through 15 high-energy songs. Tonight, they performed 17 – the same number as when we caught them at Yokohama Arena last year. That’s two hours of constant singing, dancing and smiling. The only real break they got was during new nu-metal anthem KARATE, which involved a routine where they all fell on the floor and seemed to play dead for a few seconds. Metal Resistance? Resistance training, more like. 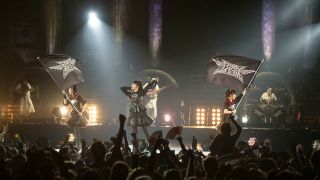 After Su-Metal sang Akatsuki solo, it was time for Yui-metal and Moa-metal’s time in the sun. Performing their song GJ! live for the first time, they skipped merrily down the runway that halved the arena, flanked on both sides by a sea of outstretched hands and accompanied by singing and screaming voices. Could spin-off shows be in their future? They’re More Than Gimme Chocolate!! While the tune prompted one of the biggest sing-alongs Wembley’s ever seen, the girls are far from being one-hit wonders, and the fans know the words to every track. The green spotlights highlighting 12,000 people waving their arms during the reggae bit in 4no Uta is one of most surreal things we’ve seen at a metal show. The bursts of CO2, jets of flame and fireworks made the show feel special, too. We can only hope that next time they’ll bring along their mysterious floating pyramid. One sleep after the festivities of Fox Day and the release of Metal Resistance, we were treated to the live premiere of the mighty Meta Taro – the album’s battle-metal inspired song – complete with a marching dance routine executed with military precision. They also debuted Amore, allowing The Kami Band to show off their chops with some classic metal soloing. Babymetal are the first Japanese band to headline Wembley arena. Let the enormity of that sink in for a moment. As they sung climactic album and set closer The One, many fans waved the Japanese flag or raised one from their home – we spotted the colours of the UK, Norway, France, Ireland, Germany, Denmark, Quebec and Slovakia. Towards the end of the song, the two big screens displayed the faces of fans back in Japan watching the show via a live stream. We are The One.